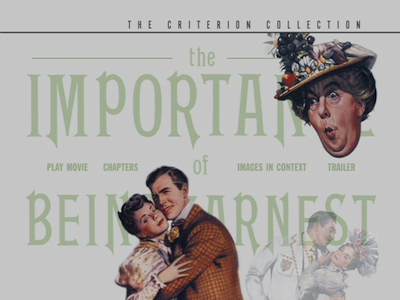 I hesitate to call The Importance of Being Earnest a trifle, as the literal meaning of the word, particularly when applied to an artistic endeavor, is to suggest that it's of little actual merit. 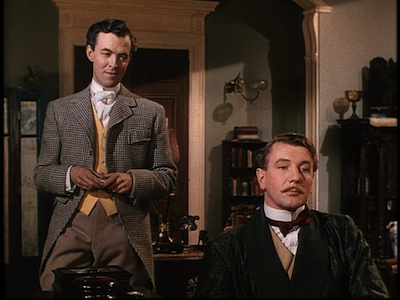 This, of course, is not the case with Oscar Wilde's play, a comedic triumph that is a most distinct pleasure to watch (or read) in whatever form you find it, including this 1952 film version directed by Anthony Asquith. And yet, I like the idea of calling it a trifle because The Importance of Being Earnest is easy to consume, delightful for its duration, and altogether delectable. Not unlike the layered dessert which bears the same name. 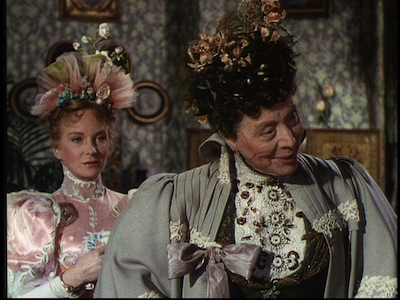 In fact, given the discussion of drink and cakes and other tasty treats during The Importance of Being Earnest, it would not be outlandish to make a comparison between Wilde's comedy and the booze-soaked confection where all manner of pleasing ingredients are stacked together to create a whole far more fulfilling than the sum of its parts. In the 1952 version, Michael Redgrave stars as Ernest Worthing, the notorious bachelor with a scandalous backstory: as a baby, he was abandoned in a handbag in Victoria Station. He knows neither where he came from nor how he was lost. His surname was given to him because Worthing is where the man who found him was heading at the time. The subject of names and origins becomes important because Ernest wants to marry his posh paramour, Gwendolyn Fairfax (an appropriately stuffy Joan Greenwood). Ernest must produce some kind of proof to suggest he has aristocratic bearing to please Gwendolyn's mother, the Lady Bracknell (Edith Evans), a pushy old woman with unwavering beliefs in how things should be done. In doing this, Ernest will also have to reveal that his name is not Ernest at all, but John, a name Gwendolyn finds far too boring for a husband. Ernest is a fictional identity John created for himself for when he is in the city, allowing him to gadabout town while protecting his reputation at his country estate. It's all rather complicated already, but given that The Importance of Being Earnest is considered a comedy of errors, the complications will only compound and multiply. (I can't help now but think of an actual trifle comedy of errors, when Rachel on Friends mixed her dessert recipe with one for shepherd's pie and made a trifle where meat and peas mingle with jam and custard. Oh, how much more can this metaphor withstand?) 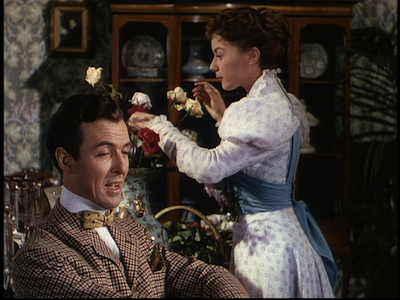 At his country home, Jack/Ernest has adopted his own ward, a young woman by the name of Cecily (Dorothy Tutin). It's for her sake that he wishes to remain untarnished and leave his London activities in London. Only, the scandalous tales of Jack's younger brother Ernest fascinate the sheltered girl, and she has fallen in love with the rapscallion sight unseen. Likewise, Gwendolyn's cousin and Ernest's friend, Algernon (Michael Denison), is intrigued by this lovely young innocent that apparently exists far from prying eyes. Ernest's insistence that they should never meet only further piques Algie's interests. He decides to go to where she is, not only to meet her, but to hold his buddy's feet to the fire. Once there, Algernon pretends to be the long lost Ernest the teenager has heard so much about. What follows, of course, is a series of misunderstandings and dubious efforts on the part of both Jack and Algernon to prove they are who they say they are and thus both become earnest (i.e. serious husband material). Anthony Asquith moves the play from the stage to the screen without over-adapting it but still managing to free himself from the limited playing field that a theatrical performance understandably requires. Though one can still perceive the act breaks and most scenes remain in a single locale, Asquith uses the very cinematic tools of cutaways and close-ups to give the story movement and vivacity, while also giving each character his or her chance to shine. Redgrave and Denison, who comes off rather like the original Hugh Grant, have a good rapport, and their banter is marvelous. 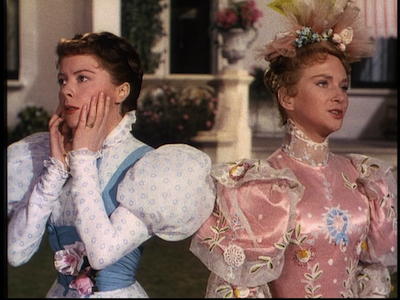 Both are verbally dexterous enough to handle Wilde's cleverest dialogue. The pair are only bested by the young women. 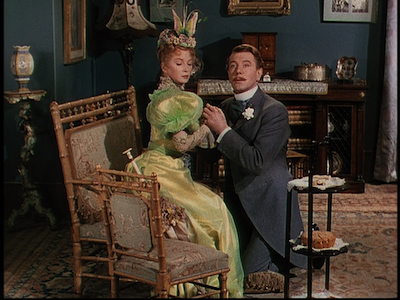 The funniest and most biting scene in The Importance of Being Earnest is between Cecily and Gwendolyn, when they both believe they are engaged to the same Ernest and so attempt to one-up each other with evidence that the other is mistaken about the man's affections. The barbs are sharp and delivered coldly, underlined by amusing reaction shots from Cecily's attentive butler. This droll layering of meaning is, of course, an essential component of Wilde's writing, both in his comedies and his dramas. One could actually see Ernest as a kind of distant cousin to Dorian Gray [review]. Thematically, both have invented a second persona to carry the burden of their sins, though with far different outcomes. In a way, Ernest's differing personas also represent a kind of reflection on the stages of life and growing up: when one is the younger brother, one is expected to have misadventures; as one is older, one must adopt a more responsible demeanor. 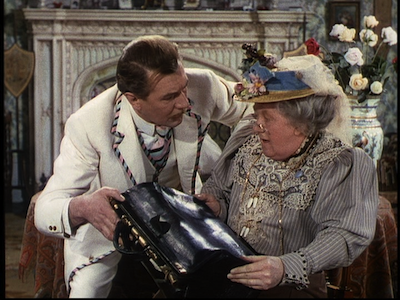 There is also something amusing in how Ernest originally came to be lost, dropped inside a valise in place of an elaborate three-part fiction, Mrs. Prism's apparently dreadful, over-sentimental novel. In her confusion, Prism makes the choice of the dedicated artist, even if it is just a Freudian slip--the responsibility of children would distract her from her work. Discard the infant, nurture the muse! While revisiting Asquith's appropriation of Wilde is always a joy unto itself, I should note that I pulled The Importance of Being Earnest off the shelf for another reason. Over the next two months, the Northwest Film Center in Portland, OR (where I live), will be conducting a course on “Literature Into Film.” Each week, students will read a work of literature for their Monday night class, and then on Wednesday, there will be public screenings of the corresponding cinematic appropriation. The Importance of Being Earnest leads the way, and will be shown this coming Wednesday, April 10, at 7pm. You don't have to be a member of the class to attend any of the films, and Criterion fans will want to check the full program, as there are other movies from the Collection featured (Children of Paradise and Last Year at Marienbad [review]), as well as Criterion-worthy selections like Robert Montgomery's The Lady in the Lake (a Philip Marlowe adventure), Michelangelo Anotonioni's Blow-Up, and John Frankenheimer's loopy Seconds.